Instructions on how to build a nuclear reactor have been revealed from five sealed envelopes that have lain hidden for almost 70 years. The documents were sent to the UK's Royal Society for safekeeping by James Chadwick, discoverer of the neutron, during World War II. He felt their contents, which described cutting-edge science, were far too sensitive to publish at the time. The envelopes were recently discovered in the science academy's archives. They were opened on Thursday to mark the 75th anniversary of the neutron's discovery. 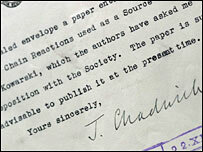 The publication of James Chadwick's paper, The Existence of a Neutron, kick-started the field of nuclear physics. Keith Moore, head of library and archives at the Royal Society, said: "The papers have only recently been discovered as part of our ongoing programme to catalogue the Society's archives. "The documents have been sealed for so long it only seemed right to wait for an occasion to open them. The anniversary of Chadwick's discovery seemed fitting." The envelopes contain the work of two French scientists, Hans Von Halban and Lew Kowarski, who worked in the Cavendish laboratory in Cambridge. The documents detail experiments on nuclear fission, covering the components needed to make a nuclear reactor, how to create plutonium from uranium, and methods to stabilise nuclear chain reactions. Dr Brian Cox, a particle physicist from Cern, said: "These papers describe what was cutting-edge science at the time. "The sheer amount of knowledge that these papers contain amazes me - only eight years after Chadwick discovered that a neutron even existed, these scientists are already looking at how to use neutrons to bring about nuclear fission and energy. "I can see why these papers were locked away during the war - they contain details that could be used to build a nuclear reactor." 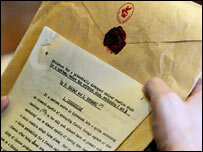 The sealed envelopes were accompanied by a letter from Professor Chadwick. Recognising the possible consequences of nuclear fission's massive energy releases, he wrote that the work was "inadvisable to publish at the present time". Dr Cox said: "These papers are a truly significant part of nuclear history. They provide a fascinating insight into the inquisitive nature of scientists working in a field moving so rapidly it was almost outpacing them. "It is fascinating to read their views on what might come of their research - and how accurate some of their predictions have been."